Ready for every season, this beautiful down alternative Superior pillow set is professionally crafted with microfiber fabric. 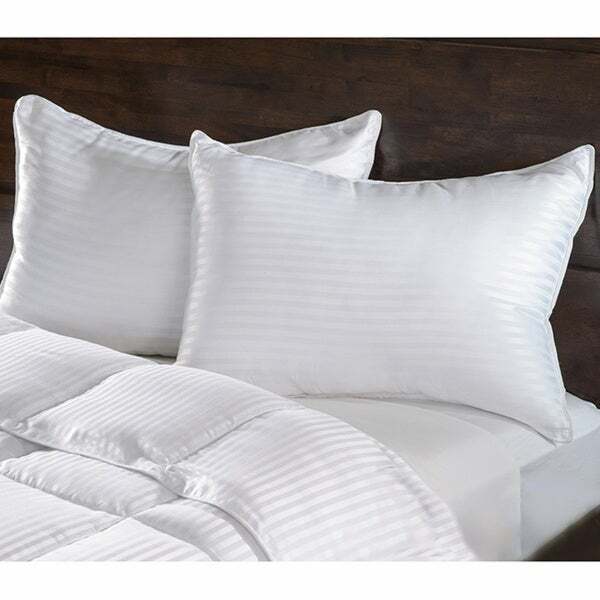 Complete with corded edges, these medium-firmness pillow suit any sleeper. The elegant and durable construction makes a great addition to any home. Standard: 20 inches wide x 28 inches long / 26 oz. King: 20 inches wide x 36 inches long / 32 oz. These Pillows Will Change Your Life! This is the second time I purchased these miracle pillows. I had the first set on my guest bed and my aunt was visiting and said she was in love with them, so I sent 2 home with her and she gets great sleep for the first time in ages. My daughter, who sleeps horribly, tosses and turns, etc...I loaned her one of the 2 I had left and she got a decent nights sleep...I loaned her my last pillow and she had the most restful nights sleep in years. She didn't wake up stiff, she didn't toss and turn...she slept. Who would think a pillow could change your life. So, I ordered this set for her and finally got mine back :)....and she has been sleeping soundly ever since. We call them the miracle pillows. I might just buy sets for all of my friends and family so they can experience a good nights sleep as well. *Note, we have all found the key to a heavenly sleep is to put a firmer pillow behind the miracle pillow. Just a little hint. I've wanted new pillows for so long and I have finally found the perfect ones!. These pillows are fluffy and firm but not hard, they conform to my head like they were made for me, I highly recommend. The pillows are very soft but don’t feel as full as I’d like. On of them had a snag about four inches long in the fabric. Soft and comfortable, good for allergy prone sleepers. Love that they come in a set of two pillows. Very nice when setting up household in a new location, great excuse to replace worn bedding. Ideal for back sleepers. Not the greatest for side sleepers of if you like a firmer pillow. Awesome pillows!! Planning to get another set! These down alternative pillows are amazing! I was skeptical because I have purchased many pillows. As soon as these got here today I put them in the bed to try them out. I was so comfortable I actually fell asleep and ended up taking a small nap. Very comfortable and I didn’t have to adjust it once, like I usually do constantly with previous pillows just to fall asleep. I am a side sleeper and just from my a few hours today I would recommend these pillows. These are softer than I expected. They are king size so I can finally use my king pillow cases! But I expected them to be medium firm but they are extremely soft and giving. Comfortable soft pillows. Great for back or side sleepers. These are great pillows for a good price. Comfy for side sleepers! These pillows are very flimsy. Definitely not ideal for use with shams. These are very nice pillows. Not too thin and not too puffy. My son loves them and I will be ordering more for guests as well. Would recommend these! These are by far more comfortable than I thought they would be. They have a bit of memory foam feel, but not too much. We love them. These Are my new favorite pillows. We had to get the king Size and they are almost as big as a body pillow. We rate these higher than stars if possible. These arrived on time and fast. Best Pillows I have ever bought and are worth it! My head sinks into the pillow like a cloud, have gotten a great nights sleep with these! Pillows are extremely comfortable. They have not flattened with use. I hoping the quality is as stated. "Where are these made and where is the source material from?" Hello Kitty, this item is made in China.Thank you for shopping with us. "Is it the Set of 2 $36.97? or each pillow is $39.97?" Hello silvacindy22, this is a set of 2. Thank you for shopping with us.